During the last year or so a prominent new landmark has appeared on the San Francisco waterfront — and no, this time we're not talking about that wretched skyscraper at One Rincon Hill. This point of interest is located a little farther south, in a Pier 70 berth at the historic Union Iron Works shipyard (now operated by BAE Systems). It's a 1950s-vintage cruise ship, actually, and it's unlikely that anyone passing through the city's Dogpatch neighborhood in recent months would have missed the sight of the vessel's distinctive smokestacks, which are painted in festive tropical colors. The ship is the former SS Independence, and she's now in retirement. Jonathan Haeber (aka Tunnelbug on Flickr) recently managed to get aboard the Independence, and he brought back an entire gallery's worth of images for the rest of us to oogle. The arrival of the Boeing 707 and Douglas DC-8 jetliners in the late 1950s gradually siphoned off demand for trans-oceanic sea travel, and by the late 1960s she was pulled from service. Later, the Independence was repurposed for leisure cruise duty during the 1980s and 1990s, mostly between islands in Hawaii. But it's also possible — and indeed likely — that she'll be broken up for scrap. And that would be *most* unfortunate. The Independence is eerily intact. Many of the original furnishings and tools still sit in the different levels of the boat. Once inside, the 400-odd cabins seem to blend into each other and all resemble each other. However, the crew rooms each feature their own unique quirks. For example, each crew restrooms has its own individual tile design and style, some of the showers feature soap holders with the SS Independence insignia on them (probably original). The brass parts have been taken, as has the original wheel to the helm (which nearly left me in tears). 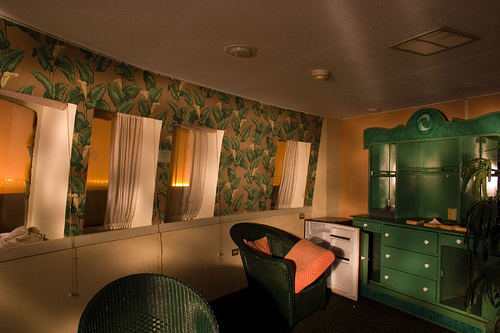 The presidential suites are interesting, and have a green decor (and not a very attractive green at that). In one conference room was a folder for Alcoholics Anonymous meetings, presumably for crew members, as it was in the crew's conference room. The toiletries, bedding, and room keys are boxed by the thousands in the service closets. The kitchen is humongous, and it's made entirely of stainless steel. The persistent scent of mold permeates the air. The engine rooms are incredibly clean. 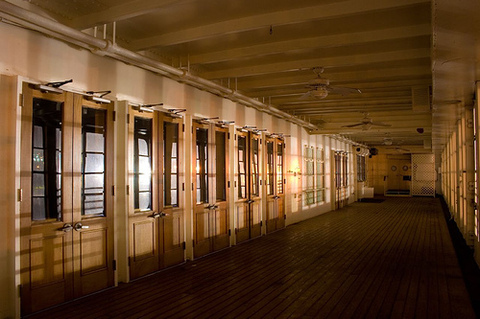 The turbine room (the Indy is one of few remaining steam-powered cruise ships still floating) -- the turbine room has its own privy, with a haphazardly constructed curtain that surrounds a lonely toilet. There are three bars, one theater, two propeller shafts, at least three lounges, two pools, a beauty salon, gift shop, and much more. Oh, and did we mention that we're just a liiiiiiiiiiiiiittle bit jealous of our friend Jonathan Haeber? Well, there -- we said it. And it's true: We're very jealous. But if we couldn't go ourselves, we can at least be grateful that he came back with so many fab photos. There's a link to the full gallery of his pictures below, and be sure to check out his blog while you're at it. The SS Independence has departed San Francisco, most likely en route to the shipbreaking yards of India. 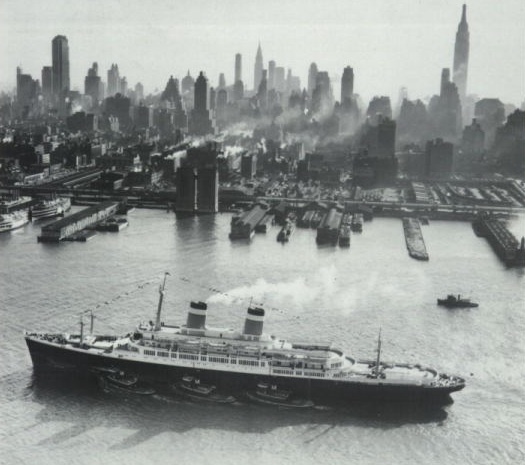 Complete details and photos in our updated post: Farewell, SS Independence. My wife and I took a Hawaiian cruise on the Independence in 1993. Our daughter was concieved on that ship. These pictures really bring back some memories, but it's sad to see her in such a state. I hope they put her back in service. I'll be second in line for tickets, after you. Thanks for these great pictures. The S.S. INDEPENDENCE is an OCEAN LINER, not a cruise ship, although she was pressed into cruising service. There is a difference between a cruise ship and an ocean liner, and it's annoys the hell out of me when people say things like "It's a 1950s-vintage cruise ship..." But people today just don't know the difference anymore, and make these kinds of erroneous comments. This would make a really kickin' hotel/nightclub complex--if the economics won't support using the ship in transit, hopefully some bright entrepreneur could convert it to shoreside service, if not in SF than perhaps in Boston, NYC, Miami, or any of the other large port cities that always seem to need more hotel rooms. I have been saying for years that the Independence should be brought back to Boston where she was built. She would be so beautiful on our (currently developing) waterfront, right near our new convention center. Also, although she lost her sister the SS Constitution, we have a famous ship named Constitution here she could be paired with (this famous ship inspired graphic in the original American Export Lines logo). My grandfather, Captain Sydney Blackledge worked for American Export Lines. He was vice-president of operations when he retired in the late 60's I believe. My mother has pictures of this ship and other mementos. She went on the ship to Europe a few years after she was built. She was happy to hear that the ship has not been scrapped and hopes that it will be returned to service. I boarded the Independence at the Rock of Gibraltar on 12/24/1959. My father was in the Air Force and we had been living in Spain for three years. It was time to go home. 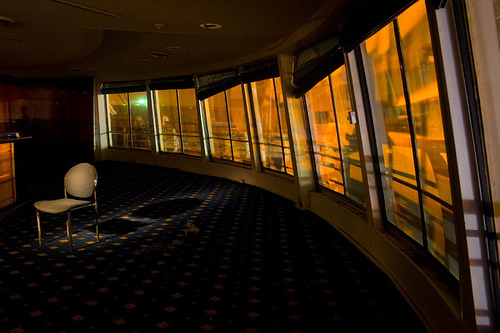 I spent a wonderful Christmas on that ocean liner and will always have fond memories of it. I was 14. There was a Christmas tree in every lounge. As the ship moved, the branches would lift up and then sway back down, as if breathing. I had heard there was a waiter named Jerry on the Independence. I was hoping I would get a chance to see just how great a waiter he was. Others had told me how wonderful he was. As it turned out, I did get to find out. Never wrote things down. Never missed an item. Never placed an item with the wrong person. Awesome. And, after being out of the USA three years, it was overwhelming to come into New York's harbor past the Statue of Liberty. Absolutely terrific. My name is Erik James and I am emailing you today to make you aware of something very important that needs immediate attention. I have attached an email that I have been busy for the last three days getting to every contact I could find that could be of assistance. I have contacted Governor Arnold Schwarzenegger, Senator Feinstein,National Trust For Preservation, San Francisco Chronicle, all the San Francisco Local News agencies, The AP, The National Park Service- various sectors, California State Preservation Foundation,Greenpeace, EPA- CA State/ Federal and various others about the SS INDEPENDENCE. I am also attaching an email that was sent with your contact information from Kevin J. Foster Chief of The National Maritime Heritage Program National Park Service. One of the United States LAST 2 Transatlantic Ships, the SS INDEPENDENCE/OCEANIC- (the other The SS UNITED STATES)- are both owned by NCL/Star Cruise Line- is in jeopardy! The reason I am emailing you is the SS INDEPENDENCE/OCEANIC is currently at Mare Island, is to be removed from there in the next 2 weeks- possibly sooner to go to India- NCL says she "Will be reused as a Casino Ship"- They do not have casino ships in India- she is going there to be scrapped- NCL has set up a dummy corporation to do just that- California Manufacturing Corporation- to resell her without them complying with Section 106 of the National Historic Preservation Act of 1966. Thus it will be illegal as she currently full of toxic asbestos- and the Basil Convention prohibits ships to leave a country without the prior removal of said waste. The workers of Alang do not have the proper safety equipment- and are without the basic necessities- shoes, gloves etc... They pull asbestos and other toxic chemicals into the open and drop them onto the beach. NCL/STAR has done this very same thing with the famous SS NORWAY/BLUE LADY- she has been illegally removed from the US, Germany and Malaysia and has broken many international laws and is currently being scrapped without the Courts of India's approval. This information was given to a group I belong to. I can give you the name- but do not want it published as this will jeopardize our bid to save the other ship the SS UNITED STATES. The information could be confirmed through the US Coast Guard- as they have to know when a (dead ship)- one that has to towed- will have a clear channel to be removed. The SS INDEPENDENCE is a very historic ship in her own rite- not to be compared to the SS UNITED STATES- she has taken numerous celebrities and royalty across the Atlantic. She is part of Americas Maritime History and should be preserved. Her complete history can be found on the website that I have attached below. Here is a website that has a lot of excellent information on the SS INDEPENDENCE, SS UNITED STATES, SS NORWAY-as well as what NCL has been getting away with- www.ssmaritime.com - when clicking onto this site please scroll down to the "News Updates Page- then on that page scroll to the middle where you will find the link to the SS INDEPENDENCE. It would be nice to get this Historic ship saved and keep her in the US where she belongs. I am sure if this was public there would be some individual to purchase the SS INDEPENDENCE. I appreciate your return call and hope you will be able to do something. This letter is in reply to your concerns about the steamship INDEPENDENCE, expressed to Michael Taylor of the National Trails System Office of the National Park Service in Santa Fe, through Dr. Larry Murphy, chief of the Submerged Resources Center, also in Santa Fe. You expressed two concerns in that email letter yesterday. One was the apparent imminent loss of the historic passenger steamship INDEPENDENCE, and the other was that you understand that the vessel is to be scrapped in unsafe conditions in a country which does not abide by environmental protection regulations that are required for the scrapping of American flag vessels. She should also be able to put you in contact with the responsible office within MARAD to inquire about any planned movement of the INDEPENDENCE from California, and if they have any knowledge of the future destination of the ship. They should welcome information that might prevent violation of US environmental and export laws that you suspect are intended to be evaded. Mr. James, or is it Mr. Abelove, or is it Mr. Phillips or is it Mr. Bonk? You need to be more careful with the games you play sir, you have slipped up in your emails like so many times in the past. This guy is a game player who runs around online under multiple ID's because he has been recieved less than hospitable due to his outrageous claims. Mr. James aka Mr. Abelove has generated gossip about the Independence's owner (not NCL contrary to the trash he has generated), can't even get her current position correct for people to go and "visit". Calls her seaworthy and "in her original AE configuration". Not acknowledging she was pnly allowed to sail on inter island service, not the open seas. Her "AE configuration" was long gone and altered with small pockets here and there of originality. In short, twisting the facts, keeping multiple ID's and all around game playing will only doom any attempts at generating publicity for this "cause". Mr. Abelove, like Mr. Bonk and his postings under Will Phillips you may want to becareful with the email you are using to post...in short keep it straight. The only ones I see doing business with you are those who don't know your history. Edward Millinese- is highly mistaken and should keep his infantile remarks elsewhere- He probably works for NCL and thus has to try and keep the truth of what they are actually doing- BREAKING THE LAW! Why else would they set up a fake corporation to sell her- California Manufacturing Corp.
Look it up- I did I called the Secretary of State of CA= no such corp-FAKE! They had no intentions of sailing her anywhere else. They purchased her and sailed her faithfully and safely for over 20 years in Hawaii. My name and email are correct- I do not have to have multiple identies to tell the truth- Yes I made a mistake of the location-and corrected it. Amazing how some of the smarttest people- are also the most ignorant! I would be glad to discuss this with anyone that is interested- my email is above and I will give you my cell number- I can hardly wait to hear from you or anyone else who really would like to know the truth- other than from someone who would more likely see her scrapped than saved. The SS Independence was towed out of San Francisco Bay today. Where to begin with Erik James..
1. Who are you, Erik James or Corey Abelove? The name Corey Abelove has been signed to messages under your email on the SS United States page on Yahoo. And Corey Abelove is the person "appointed" to continue Rueben Goossen's campaign to save the ship. Funny thing just 2 weeks ago he couldn't find anyone to help him in the U.S. and suddenly "Corey Abelove" comes out of nowhere, literally. Maybe because Erik James has had several run ins with his postions on various liner boards? Might explain why you have carried this "campaign" on only one of the many liner boards available to you online. 2. Why would you assume California Manufacuring Corporation would be incorporated only in California? Your lack of education and research has become painfully clear. I suggest you cover all the bases before you post as you clearly have no understanding on what's involved with incorporations. 3. You did indeed say the Independence had much of her original decor. On the SS United States Yahoo site message #13712 you posted and I quote " But also the passenger areas, many of which are AE era". Untrue and misleading. 4. 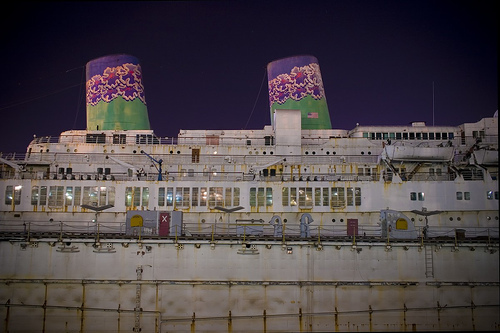 How do you know the Indpendence was sea worthy when NCL bought her? As usual you have left out the fact it was over a year of sitting around inactive before NCL came into the picture. Her Newport News refit has nothing to do with the damage not being properly laid up caused her. Again you demonstrate a lack of understanding in these matters. An example of the damage she suffered was when she was in the care of our own gov't her radar mast was knocked down. These facts somehow evade your arguements. Undestandbly when you prefer emotion to logic. 5. If you had bothered to research her certification when she was in service you might have found that she was only allowed to sail under limited island service. In simple terms Erik/Corey, she was in no condition to sail the open seas with passengers. Despite what you'd like to believe she was not in top shape towards the end. Perhaps your local Coast Guard office could explain all this to you. 6. You state that her prior owners had "no intention" of sailing her anywhere else. Now ask yourself Erik/Corey, why was that? I'll ask you again, who is Corey Abelove? Why does that name appear under your email address? (Yahoo United States page message # 13698) and other messages as well. Is Mr. Goossens aware that Erik James is leading his campaign? You might mean well but game playing is never an answer. To use your own words Erik/Corey..stop acting infantile. I just want to say that I will never forget sailing on the SS Independence in 1958 from Naples to Genoa to Algiers, through the Straits of Gibraltar and on to New York via the Sun Lanes. I have our passenger manifest from that trip and will always treasure the wonderful experience sailing on her. 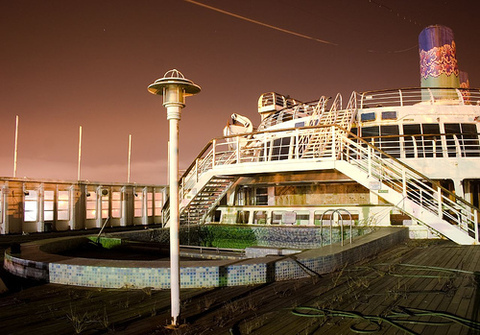 It’s very sad to see the SS Independence go. She is a grand ship. I had the privilege to cruise Hawaii in 2000 when she was in service and it was great. It was the best vacation I ever had. NCL is unbelievable. I have been on five cruise and I will never cruise with NCL!!! I sailed on the Indy from 1989 - 1991. We did a TransPac to Portland for drydock that was smoother than any crossing of the Molokai Channel. With the Constitution at the bottom of the sea, the loss of the Indy is even more painful. (Okay -- full disclosure. Every Indy dog got a hell of a kick seeing the Connie sideways in that drydock.) Those two ships were part of American history, American built and built to last. Proper maintenance would have kept her running for years to come. But with the super-sized cruise ships that now exist (aka condos on water) the Indy was too small, did not have the amenities that cruisers have come to expect and was, for all intents and purposes, functionally obsolescent. All that being said, scrapping her may be financially expedient but it is a sin against the gods of the sea. She could still be put to good service any number of ways. With a little effort on our part, NCL could easily become a dying company. Back in the 80s it was known for carrying the world’s oldest passengers. Gathering new customers in a more competitive marketplace is tough. We can make it tougher. Financial revenge is the best. Boycott NCL, recommend other cruise lines. With the exception of Carnival (the Walmart of cruiselines) almost any cruise line is comparable or better than NCL. Remove NCL from the marketplace and it won’t be missed. In the meantime, aloha to a fine ship. The memories and frienships remain strong. Let me introduce myself. My name is Corey Abelove, and yes, that is my legal name. It is not an alias, and I am a separate individual from Erik James. Erik and I are good friends working on maritime preservation issues. I would like to point out that in addition to some of the above attacks/statements made towards Erik and I, that we have also recieved several illegitimate and threatening emails from people claiming to represent the Indian Ship Recycling Industry. The fact of the matter is that old ships such as the Indy, contain very high quality steel, and illegal ship-breaking is a very profitable business for some of the companies involved. As for claims that we do not know who owns her, or even where the ship is at the moment, no and yes. We have obtained documents (which are public record in the US) from the USCG showing the CURRENT ownership/registration. We do not know exactly where the ship is because the tug Pacific Hickory has turned off its locating beacon quite some time ago. It should be noted that according to USCG in Hawaii, SS Oceanic (current name of the Indy), is not required to have a beacon as she is classed as cargo. It should also be noted that after the tow left San Francisco, the destination was changed from Singapore to Dubai. For those of you that are not aware, Alang India (site of the worlds largest ship-breaking yards) is roughly between Singapore and Dubai. If there does exist the unlikely outcome of the Indy not being scrapped, then why the pattern of evasion, and why all of the threatening emails ? Simple, a ship-breaker stands to make millions commencing an illegal demolition of the Indy ! I would like to ask everyone who supports both the "Save a Classic Liner Campaign", as well as the Basel Action Network, to stay vigilant ! Not only is our beloved Indy at risk right now, but so are the lives of countless breakers yards workers who take these ships apart with no protection from toxic substances. even greater potential for profit than just simple recycling of steel. My name is Corey Abelove. There have been many comments questioning the very fact that I am even an individual. Several people have been saying that myself and Erik James are one and the same person. I am here to set the record straight ! We are two separate individuals. Erik and I have been working dilligently to save the Indy from a probable illegal scrapping. Please keep in mind that vessels such as the Indy contain steel of a VERY high quality that commands a premium on the scrap market. Hopefully this will help to explain some of the dissinformation that has been circulated surrounding this case. I will also say for the first time< that I live in Las Vegas, so if any of the scumbags who represent either NCL or the Indian ship-breakers would like to meet me in person, then I am gladly willing to meet you at any time and place here in Vegas of your choosing ! Furthermore, I have ALL means to defend myself, as well as the evidence to show that parties that are guilty of numerous crimes will be brought to justice ! Please excuse these somewhat repetative posts. I am just re-posting commentaries that I have put on various other web forums. Some of my commentaries have been returned to me by servers as "undeliverable". My challenge to NCL/Indian Ship-Breakers to meet me in person in Las Vegas is REAL ! There are many of us out there that will continue to fight the good fight against those who will continue to put profit above conscience. Let me reiterate the realization that yes, ships do need to be scrapped from time to time. However, it is absolutly a moral imperative that this be done in a manner that takes into consideration both human as well as environmental factors. Nice post Jim - you're exactly right. Let's hit NCL in the only place they're likely to notice - their pockets. Let's help put the final nail in the coffin of their "US flagged" service. AMERICANS don't cruise Norwegian....... NCL has no respect for the American people - let's keep our hard earned money out of their greedy pockets. THIS IS A TOTAL DISGRACE. I SAILED ON THE INDEPENDENCE IN 1985. 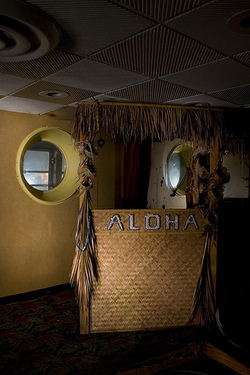 I SAILED ON THE PRIDE OF ALOHA IN 2004. NCL OWNS BOTH SHIPS. THE CRUISE ON THE INDEPENDENCE IN 1985 WITH AMERICAN HAWAIIAN CRUISES WAS BEST CRUISE I HAD EVER TAKEN. THE CRUISE ON NCL'S PRIDE OF ALOHA WAS THE BIGGEST JOKE OF ALL TIME. I HOPE NCL GOES BROKE. THE INDEPENDENCE SHOULD BE SAVED AND RESTORED FOR FUTURE GENERATIONS. NCL HAS NO BUSINESS BEING IN THE CRUISE BUSINESS. WOULD SOMEONE PLEASE SAVE THIS GREAT SHIP. WE HAVE ALREADY LOST THE SS CONSTITUTION. PLEASE, SAVE THE INDEPENDENCE AS A PART OF OUR AMERICAN SHIPBUILDING HISTORY. I WILL NEVER FORGET THE TIME AND THE WONDERFUL CREW THAT SERVED ON THIS GREAT SHIP. SAVE HER NOW--------SAVE HER NOW. and NCL ? what that ?? i hope it is quickly history too! Because Independence and her sister ship Constitution were built during the Cold War with subsidies from the US Government, they were earmarked for conversion to fast troop transports in time of war, and their owners (American Export Lines), were obligated to reserve a certain number of spaces on every voyage for the transport of military personnel and their families to and from the Mediterrenean, largely to Italy, where the US maintained military air, land, and naval facilities. Because my father was an Army officer, we crossed to Genoa from New York in 1956 on Constitution, and returned in 1959 on Independence. I was ten on the outbound run to Italy and thirteen on the return. They were wonderful ships, with wonderful crews. The memories of those voyages remain with me today, as vivid as they were then: awakening (our cabin was in first class) to the vibration and roll of a big ship on a long voyage, looking out the port for that first view of the day of the great Atlantic, rolling away to the horizon; the smell of machine oil and cooking odors that seemed to penetrate every inboard passage; the sound of the chimes the stewards used to announce various functions as they walked through all the lounges and passageways; the theater where we watched first-run films (I remember it was air conditioned, and we damn near froze in there); exercising our German shepherd, Lupo, on the return trip from Genoa, at the kennels at the base of the Number Two funnel; my mom and dad all dressed up for their dinner at the Captain's table one evening; she in an off-the-shoulder number, he in his Army Dress Blues. A year ago (2007), I visited Independence in the yard at San Francisco - was escorted through the ship by the caretaker/watchman, a retired US Merchant Marine officer who came in once a week to check for watertight integrity and other items of safety for her owners - we went from the stem to the stern and from the bridge to the spaces where no kid would have been allowed in the 1950's - never knew then she had a brig and a padded cell, or that there were weapons kept aboard (not many, but enough) to handle 'disruption or mutiny'; saw the engineer's annunciator station, with an amazing number of voyages chalked up on the board; saw Grace Kelly's bathtub (the only one on both ships - installed for her crossing to Monaco and never ripped out); and had the fun opportunity to point out to my guide that the 'paint and parts storeroom' at the base of Number Two funnel was actually the old kennel - in later years they had simply taken the cage doors off the spaces and used them to stuff in rope, paint, and other gear, but the little holders for labels of the names and owners of the pets were still just below the lip of the cages, and I could feel the presence of our long-dead friend Lupo... in fact, that whole ship was full of ghosts for me... and good ones. So 'Vale', Independence; she was a great ship, and she will be loved and remembered long after they scrap her and turn her into consumer goods and automobiles.